Barbara Wiesinger recently returned to Brazil after six months of home assignment in Germany. She had a good time with many opportunities to reconnect with people and to spend time with her family and church. She was also able to get to know many new people and to share about God’s work in Brazil and about His grace in her life. 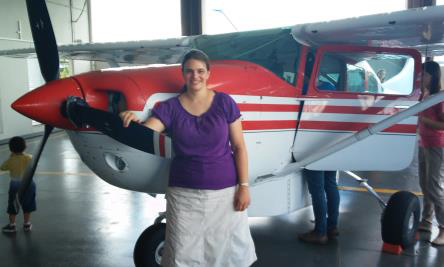 Before her time of home assignment, Barbara had been helping in different departments at the mission headquarters in Manaus/Brazil, as there are personnel needs there as well as in the church planting teams. She especially enjoyed being involved in the consultant department as a secretary. Now Barbara has joined the church planting team among the Hixkaryana people. Last year in May, she had the opportunity to visit the village again and to get to know her team better. They were able to talk through some details regarding working together. All Barbara’s colleagues are Brazilians. One lady has been working in the team for about sixteen years. She knows culture and language well and is mainly involved in lesson preparation and teaching. A young couple joined the team about a year and a half ago and are just ploughing their way through the Hixkaryana culture and language. Barbara is excited to see what the Lord is doing with the Hixkaryana people. Even though they heard the Gospel many years ago (and there were certainly people that were saved in those days), it is only in the last couple of years that many of them have started to really understand the Gospel. The New Testament was translated more than 40 years ago, but there was very little teaching. Since they have been taught God’s story chronologically, many of them have put their trust in their Saviour. Initially the teaching was done in Portuguese but now they have also started to teach in the Hixkaryana language. There is still a lot to be done, but their desire to learn more and to share not only within their own people group, but also with others around them is encouraging. This month Barbara plans to move in to the village. Initially she will be able to live in her co-workers house until her own house is built (possibly in July). There is still a lot to be prepared for the house building even though the Indians are already preparing the wood and they will also build the house. Barbara counts it a privilege that her future neighbour in the village knows how to build houses and he is a trustworthy and diligent man. Sometimes the whole project is a bit overwhelming for Barbara, but she knows that the Lord is going to help her step by step. Please pray that she can keep her eyes on Him and that she may have wisdom, humility and everything else needful to do the work He has sent her to do. Pray for her as she starts culture and language study and that the Lord will get the glory in everything. Thank you so much for standing with Barbara in prayer.